Choose the size of your first corner rounding die piece. Your first one is included within the price of the order. All other sizes are sold separate. -- Please Select --1/8" 1/4" 3/8" 1/2"
Use the Lassco Wizer CR-20 Cornerounder to add stylish round corners to your projects and printed materials. Round corners are safe, look professional and make your projects look stylish. The Lassco CR-20 Corner Cutter is a desk top corner rounder that is ideal for a small office, design firm, or even for scrapbooking or craft projects. The CR20 accepts a huge range of cutting units maxium cutting depth of 1/2 inch. This unit comes with one standard cutting die (choose from a 1/8" radius, 1/4" radius, 3/8" radius, and 1/2" radius). Its 5" x 10-1/2" size makes it easy for use all around any office or factory. Accepts Standard and Special size Cornerounder cutting units. Corner Rounder Shipping Weight 4 lbs. I didn't know what to expect but was pleased. It cut through stacks of 10ish 16pt cards nicely. It would benefit from a pusher guide, but did fine without. DOES A DECENT JOB ON CORNERING BUT IS A LITTLE LIGHT WEIGHT AND WANTS TO SLIDE WHEN USING. A HEAVY BASE WOULD BE BETTER. I received much later than informed. Was told they had it in stock, but wasn't true. Was told they would get back to me via email or phone, they didn't. I had to call. No apologies. Will consider heavily whether I will order again from this company. Product wise it works as expected. Cuts through most Substrates and leaves a nice corner. We use these for plastic name tags mostly and it works great. However, my only complaint is the small circle in the middle of the platform that isn't smooth. When turning the laminated badges to do each corner, that little round mark tends to scratch the plastic on the bottom side. As the badges were hand cut, we did the corners one badge at a time and most of them got all scratched on the back. If cutting paper/card stock, I would suspect this would not be a problem. I'd been putting off purchasing this for years, DUH, how did I live without it. Works perfectly, can cut a lot at once, pretty sturdy, should hold up for a while. If you're using a craft-store corner rounder to cut a few sheets at a time, do yourself a favor and buy this now. I have a small internet business where I create cards, tags, wedding and baby shower items. Some of my items have rounded corners and I have been cutting them with a hand corner rounder that lasts only a few months and you can only do one or maybe two at a time. My business has increased and I need something to cut down the time I spend on rounding the corners and cut more at one time. I read up on all the corner rounders and I decided to purchase this rounder. If you are looking for a corner rounder, look so further, because this is it. I can put stacks of 110 lb cardstock into this unit and press down on the handle and everyone comes out perfect and even. My only regret is that I didn't buy this sooner! I bought the 3/8" radius to cut corners on cards and I found someone on ebay selling only the die cut blades in other sizes where you can just remove the 3/8" die cut blade and just slide in a different size. He has the best price for them so far I have found. Love the fact that this is made in the USA when everything seems to be made in China these days. The unit is decent quality. About what I expected. Not really a heavy duty commercial unit but it gets the job done. The blades are kind of expensive so make sure you order the right size the first time. Hobbyist/small business owner Review by Daniel G.
I bought this corner rounder to help make decks of cards quickly. Before we had it, we were using a hand rounder. It was not always even and took over an hour for one deck of cards. More as it started getting dull. This one did the same work in about 5 minutes. It may have been even quicker, but we had to wait for the card cutting machine that we have. For my needs, it is definitely a 5* product. Very simple setup. My only complaint is that the tiny instruction manual does not mention the latch to lift up to clean up the corner cuts. Also, if the stack of paper that needs its corner rounded is not the same size, it will not cut uniform corners. That is not a problem for me since my stacks will always be the same size, but I could see it as a concern to others. All was perfect. Review by JOSE P.
The service and support are very good. Thanks MyBinding!! Welcome to MyBinding video. This is a look at the Lassco CR-20, a manual corner rounder. Watch just how easy it is to round corners with this machine. First, lift the little side table to give you a larger surface to work with and slide your paper into the corner. A small wooden square is there to hold your papers in place while you make your punch. CR-20 can handle up to one-half inch of stock per punch. The die is sharp and precise and very consistent. 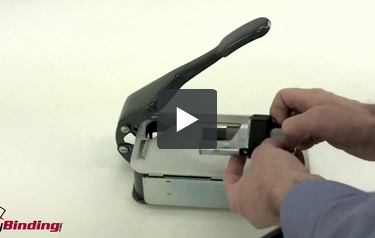 Be sure to check out our how to video on changing the dies for different cuts for this machine. That's it. That's the CR-20 by Lassco. For more articles, how to's, demos, and reviews on this product and many more, check out MyBinding.com. Welcome to MyBinding How To videos. Today's how to is easy die change for the CR-20. The Lassco CR-20 is a great little corner rounder that's easy to change its die for various uses. Just watch these simple steps. Lift the lever and remove the die by pulling it straight up and out. Change it out with whatever die size or shape you want. Place it back in the same way. Lift the lever, and drop it into the hole. Push it all the way down. Run a couple of test runs; you're on your way. Now for whatever project you may have, you have different sized corners that you can use. You're all set. For more articles, reviews, demos and how to's on this product and many more, check out MyBinding.com. I have 1000 square business cards. Is the 1/2 inch the one to purchase to round off corners? Thank you for your question. The most popular radius of rounded corners for business cards is 1/4". How long does the blade on the rounder last? How often will it need to be updated if used daily? Thank you for your question. Unfortunately there is not a definitive answer to your question. The life of the blade is effected by many variables including not only how often the blade is used but the type of material you are cutting, the quantity you are attempting to cut with each cut, how the cutter is being maintained and many more. Because of this manufacturer isn't able to provide a time frame for how long the blades will last. I need 1.2" round cutter do you offer this size? Thank you for your question. The largest radius die available for the Lassco Wizer Cornerounder CR-20 Corner Cutter is the 1/2" radius die. How easy is it to swap out dies? Thank you for your question. 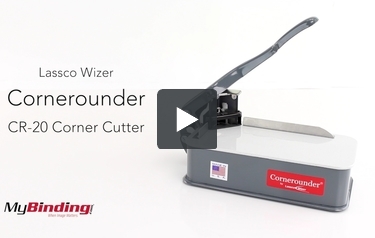 Switching out the cutting die on the Lassco Wizer Cornerounder CR-20 Corner Cutter is a easy and straight forward process. The second demonstration video on the product page shows the process. Am I able to change the radius die in the future? I want to get the 1/8" but maybe I need the 1/4" in the future...please advise thanks. Excuse me, i live in Mexico, and i want to know if the shipping have any cost, i´m interested in the corner rounded Lasso Wizer. Tnks! We do ship to Mexico. We ship to just about anywhere in the world. The best way to figure out shipping is to add your item to the cart and fill in the postal information. This will give you the shipping total for the items you are shipping. Or you can call us at 800-944-4573 and someone here can place your order for you.